Dealing with termites can be a frustrating problem for homeowners. The termites are normally called “silent destroyers” because they can take down an entire home if you do not know they are hiding there. Hiring a Mesa termite company is the best way to avoid dealing with serious problems that can destroy your home. Termites are detritus feeders, meaning they feed on dead plants and trees. They will feed on living trees that have dead parts, and they live within the soil and wood around a tree. The termite mouth is sharp, making it easy to tear apart wood easily. When a termite gets into a home, they normally destroy the foundation, shelving, furniture, and anything containing detritus material. How do you know if a termite is in your home? The easiest way to know if there is a termite problem is by looking for mud tunnels. Termites create tunnel systems that help them get around easily. These tunnels are normally found on the exterior of the home, but can be found inside the home. If the colony has matured, you will be able to see swarming termites. Termites are attracted to light, which is why Mesa termite treatments use light to detect termites in hard-to-see areas. Termites can get into the home by climbing through vents in the roof or in the siding of the home. Several vents around the home will have small holes, making it easy for water and pests to get inside. Sealant can prevent the termites from getting inside, and it prevents water from getting inside as well, leading to additional problems for homeowners. When termites are found, you need to contact Varsity termite and pest control right away. Termites are a threat to your home, and need to be eliminated before they cause serious damage to the home. Homeowners can do some helpful things to reduce the risk of termite infestations. Here are some tips to follow to prevent damage; reduce moisture in and around the home as it attracts termites, remove dead trees from your property, examine decks and the exterior of the home for signs of damage. 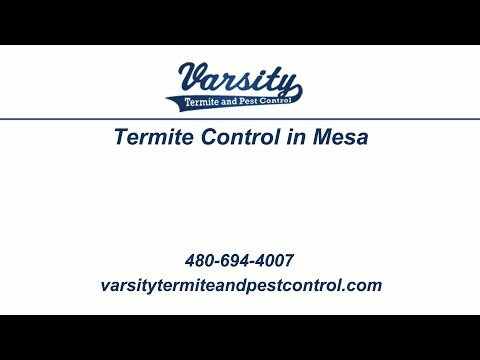 Since termites can start to get out of control quickly, it is important to hire professional termite treatment in Mesa. Without the right chemical treatment methods, termites can multiply quickly. Most people will try to kill termites, but are unsuccessful as they do not have the right chemicals available to destroy them. Call or visit Varsity Termite and Pest Control today and speak with an expert on termites as we will be happy to help you! If you have any more questions or concerns regarding termite control and want to know more information, please explore our website more or give us a call.